You’re a highly accomplished woman. Somehow you manage to gracefully maneuver the unpredictable journey of motherhood, and juggle the demands of everyday life. Somewhere along the way, you began to push yourself lower on the priority list. Lack of time, lack of energy, or both, has led you to neglect your need for exercise. You’ve reached the point where it’s starting to take a toll on your body, and your confidence. We’ve been there, so we know exactly where you’re at. Over the last ten years, we’ve helped hundreds of busy moms get their body back in shape in the quickest, safest, most effective, easiest way possible. We know with every fiber of our being that if you want this enough, you can do it too. Our low impact, highly effective, super-targeted, core-strengthening workout will help you lose inches around your waist, flatten your tummy, tone your glutes, and fit back into your clothes the way you did before you had kids. The Inner Theory has reinvented fitness for busy moms. We meet virtually with a highly experienced personal trainer, twice a week, for just 40 minutes. And most importantly, our training method works. This low impact, virtual (and on-demand), core strengthening group training program brings you the support and guidance of an experienced personal trainer into your busy schedule. In addition, our trainer is also a mom that understands your personal needs and goals. She is there on the journey with you to guide and motivate you every step of the way. The Inner Theory brings you the convenience of a virtual group meeting with a personal trainer into your home. You get to work out in the privacy and comfort of your own home, with other moms just like yourself. Just power up your computer, laptop, or iPad. Click and connect to your group in seconds! Find a comfy place on the floor say hello to your trainer, and begin to embrace the burn! In just 40 minutes, twice a week, with your own personal trainer you’ll start strengthening your core and building your confidence. Get stronger, inside and out. Let’s face it, pregnancy takes a toll on our tummies. This training method precisely focuses on your core. With as many as 35 different muscle groups connecting the pelvis from the spine to the hip area these muscles need to be stimulated in different angles to optimize their overall fat-burning ability. Our group training programs do just that! They identify each core muscle group with low impact exercises, multiple times, in multiple angles, to give you the maximum results. Supersetting is a exercise method for burning the most about of fat in the least amount of time! We target a specific muscle group, from different angles, multiple times, to optimize your fat burning ability. Supersets can burn twice as much in half the time. According to The Journal of Strength and Conditioning Research, Supersets burn more fat during and after your workout versus generic traditional training. What if I have issues with my wrists, knees, joints, or other parts? You’re so not alone. It’s very common to have some current or former wrist, knee, or joint injury that you feel might hinder your workout. The Inner Theory was created with these exact concerns in mind. The workout is low impact which means no jumping, squats, push-ups, or other contraindicative exercises that could put your joints at risk. Your trainer will also pay close attention and create any additional modifications to help make your workout go as smooth as possible. Sounds great, but… what if I can’t find time to work out? As a mom, your life is anything but predictable. That’s why we designed this program to happen virtually and for just 40 minutes two nights per week. No commuting. Wear whatever feels comfortable. Makeup-free faces and messy buns welcome. Since you’re in your own home, your children are welcome to join too. We’ll see you online every Monday and Wednesday at 8:15 PM (PST). If you happen to miss the live training, you can catch the replay at your own convenience. It’ll be waiting for you, on-demand, whenever you’re ready. What if I have no idea what I’m doing? What if I hold everyone up? No experience or physical fitness endurance required. This workout is personal and tailored to your needs. During instruction, Melissa gives three options for every body’s fitness levels. “Option one” is for those starting out. “Option two” is for the intermediate. “Option three” is the hardest level. As always, additional modifications can be given along the way. This core training program will meet you exactly where you are in your exercise journey. Your trainer will also discuss your personal goals and concerns with you beforehand and then meet you exactly where you are in your exercise journey. There’s absolutely no shame in being a beginner. We all start somewhere. What matters most is that you’re here now. Our group is a judgment-free zone. You can workout at your own pace and take breaks whenever you need. Melissa will walk you through the exercises, check your form, and if she feels you’re getting overly fatigued, she will encourage you to take a break and make sure you’re doing the exercises safely and effectively. I don’t think I’ll ever get my pre-pregnancy body back. Only if you don’t do anything about it. We’ll work together and before you know it, you’ll be sliding into a pair of skinny jeans again. Or maybe for the first time ever. What if I’m the most out of shape one there? Women come to group in all shapes and sizes and all levels of fitness. Everyone is here to support one other, not judge one another. We’re all in this together— promise! Even though we meet virtually there’s a synergy in the group. Meeting two nights a week is convenient, and having other people in the group offers a strong sense of accountability. Convenience paired with accountability will set you up for success. I’m not sure I can justify spending the money on myself. Consider the physical and mental cost of being out of shape. Everyone in your family suffers. You have less energy to play or take care of your kids, your mood may be off, and you don’t feel as confident intimately. The bottom line is, you can’t afford not to exercise. Eight weeks worth of individualized personal training sessions like this would run you upwards of $1,000! With The Inner Theory, you receive eight weeks of power-packed sessions with a personalized training program. The results are priceless. You get personal attention and the same confidence boosting, brag-worthy results for a fraction of the cost! Access to a personal trainer to encourage you as you go. LIVE Group Training is held every Monday & Wednesday at 8:15 PM (PST). The link to our virtual training room is in the Members Portal. Access to On Demand Training is also in the Members Portal. Your equipment package will be delivered to you free of charge and will arrive within 2-3 business days. Your membership will go for 9 weeks from the day you sign up to give you extra time to start with equipment in hand. We know losing weight and getting a tighter core without the traditional high-intensity workouts may seem like a stretch, but if you let us show you, we’ll prove to you just how easy it can be. We’ve worked hard to create a program that supports a busy mom’s lifestyle and builds stronger more fabulous bodies. There’s absolutely nothing here that you can’t do. If you stick with the program, in just eight short weeks we promise you’ll absolutely feel stronger, leaner, and more energized than you did before you started. 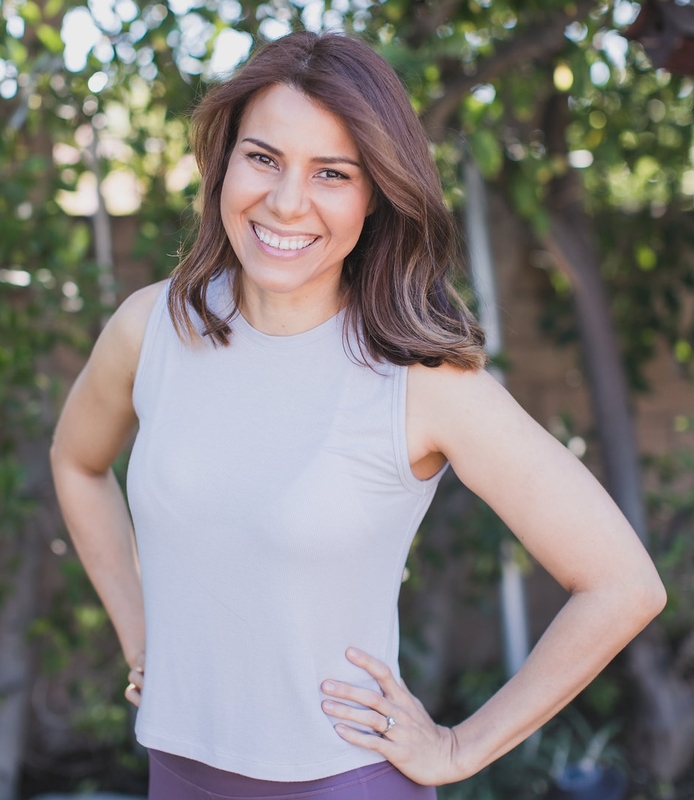 I’m a wife, a mom, a master personal trainer, and the founder of The Inner Theory. I believe when you empower a woman, you inspire a family. And that means the world to me. I enjoy helping women gain confidence, energy, and motivation through fitness. I’ve had the honor of training hundreds of women in all phases of life from pregnancy to late adulthood. I understand professionally and personally both the importance and the challenges that come with exercising after having children. My simple, yet highly effective workouts have a core first philosophy. They’re designed to help you achieve a flatter tummy, a stronger, more toned physique, in less time and with less effort than you might imagine. My journey started back when I led my first kickboxing class at age 17. Teaching and inspiring others came naturally to me. All at once, I knew I had found my calling. Over the years I’ve run exercise programs such as StrollerFit -  Exercise With Your Baby, Baby Boot Camp, Restore the Core, along with individualized one-on-one personal training for men and women of all ages and phases of life. A couple of years ago I began to feel the need for more personalized kind of training, something that allowed me to work more closely with moms to address their unique challenges. It had to be convenient, affordable, and super effective. In July 2017, The Inner Theory was born. Hello powerful woman! Thank you so much for visiting The Inner Theory’s website. If you have a question, or would like to discuss your personal goals, please send me an email, call me, or fill out the form below. Can’t wait to hear from you!